Both Toshi and I have been knocked sideways by separate-species stomach ailments over the past few days; we're on the mend but very, very tired today, so I stayed home from work and did a little sweater photography for the shop, with the help of Koi-san, the somewhat overdramatic (see first picture below, heh) but basically sweet Lady Sylvie who joined the crew last year. And everything is at http://www.etsy.com/shop/squirrelmoonknits, don'tcha know . . .
Back to add one more--this is Laura Gilkey's fabulous halter dress pattern from the DoA archives, slightly tweaked to suit my preferences. Injeong looks pretty damn terrific in it, if I do say so myself. The yarn was a PITA to work with: a commercial superwash "singles" that split and snagged and disintegrated at the slightest provocation. I will never buy any more of this stuff, that's for sure, but it produced a very nice (-looking and -feeling) fabric in the end. I'm always amazed at the way that the structure of knitted fabric overcomes the problematic qualities of the yarn that it's made from. And finally, can anybody explain to me why people on DoA PM to ask whether an item in a sales thread is available, then disappear forever without even acknowledging the seller's reply? It would never occur to me to send anyone a PM about even the deepest-buried FS thread unless I were serious about buying whatever it is that caught my eye--or about thanking the seller for the information if the item isn't for sale anymore. BLARGH. Koi-san is so pretty, and I love the sweaters!! 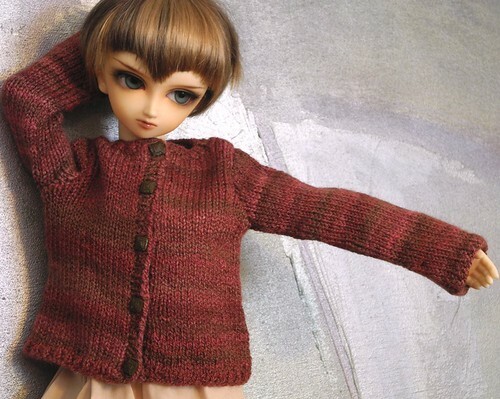 And once you get Anthea into the turtleneck, I would love to send a picture of her to the spinner--she was so excited that I made a sweater from that yarn (it was her favorite skein ever), and I think she'd be really happy to see it in its new home. I think society is changing and being polite is not something a lot of people do any more. At least around where I live that seems to be the case and even more so on-line. Or maybe they are afraid to say they aren't interested after all. But it would make sense to at least say something. One of these days I have to take some photos of what I have. Hopefully when I'm in a better place for photos. Hope you and Toshi get to feeling better! I guess I was especially WTFed by the ask-and-vanish strategy because I got PMs like that from two different people in a 24-hour span. Maybe it was Stupid Weekend on DoA, or something?? From what I see from the outside, there are still a lot of people who collect other types of dolls who are just getting into bjds. So like in the past they don't quite have the knowledge or experience that us older folks have. I know someone who just went through a very difficult time trying to sell a doll on DoA to a person who wanted a layaway and then kept changing the terms. 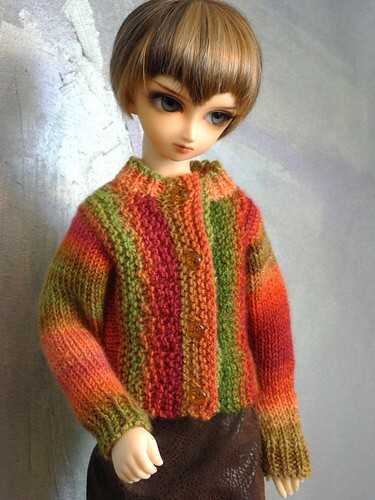 Another rather new buyer who came from less expensive dolls. Luckily they were able to end the layaway, refunded the money and found a better buyer. I've stopped selling on eBay because I couldn't stand the bad buyers there. So many people e-mail asking questions, acting like they are going to buy, saying they are going to buy and then don't. So it's not just on DoA. I know it's not fun to have your hopes get up and then nothing. I'm just glad you are still selling on Etsy. I don't want to jinx myself by sounding too confident, but Etsy really has worked well for me so far. The software is smooth as silk and user-friendly (from a seller's point of view, anyway! ), and I like the clean, straightforward look of the site. And in two years I've only run into one WTF-type buyer--who really doesn't cause me any problems, but is a source of much headdesking for me. She keeps buying sweaters and then putting them on eBay (at a considerable loss) a week or two later, even though I've told her more than once that I'll gladly refund or exchange if she wants to return something. Quien sabe? That is a very strange thing to do, unless she just is using them to take doll photos that she gets paid for? Although I would say anyone trying to sell on eBay any more is really wasting their time unless they have something that people will pay a lot for and they didn't pay much for it to start with. The fees for eBay plus Paypal are horrible on top of everything else. Etsy is good for certain things. I tried to sell my vintage Fiesta there and didn't sell a single piece. People liked them but would not buy. But if I get into to doing what I hope to in the future, I will try again with other things. It's good it is going well for you. That's the truly weird thing about this buyer--I don't think she's using the sweaters for photos (though maybe my reasoning is screwy here) because her eBay auction photos are so peculiarly bad. It's hard for a decent photographer to take such hazy, mis-white-balanced, blurry pictures even by trying, you know? And she always cries poverty when she buys from me--needs layaway, etc.--and says in her eBay auction text that she's selling things she never used because she needs the money. She's very, very nice and always complimentary when she does buy from me, so this isn't a mad negative customer. I think I'll just have to settle in my mind that this is someone with a shopping kink, and leave it be. I can only imagine how hard it is to sell vintage on Etsy. If I didn't have a super-specialized niche with something of a built-in market, and if I didn't approach Etsy as a fun hobby instead of a serious source of income, I think I would be pretty frustrated. But since I'm always astonished and thrilled when somebody does buy a sweater (well, except for Shopping Kink Lady, whose name makes my heart sink at this point), I like the fact that an Etsy shop basically cares for itself with minimal fussing on my part. Awwwww, thank you!! We're both doing much better today, though some of the tiredness is still hanging around; Toshi isn't quite as bouncy and obstreperous as usual, and I'm sleepy as can be. And thank you for the lovely compliment. I have so much fun with the knitting, and hey, those are JPop wigs, both of them. Koi-san really came into her own when I put that funny little pointy-bangs bob on her; in some outfits it does give her a bit more of a Maria von Trapp look than I intend, but it's still cute. Koi-san shoots a glare back in Horace's direction, which I think counts as flirtation on her part, heh. She IS pretty, isn't she? 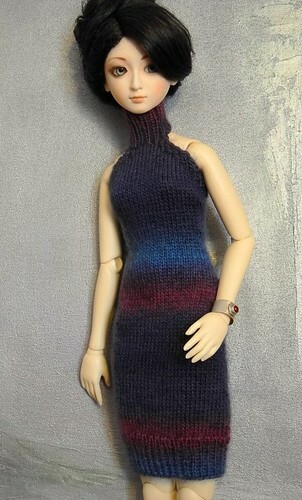 I can't take any credit--I bought her head on either the Marketplace or eBay, can't remember which, and the seller said Mingyi did her faceup. I adore Mingyi's work, but usually I think of her style as being softer than this; Koi-san definitely has an edge to her, which saves her from the insipid quality that I think Lady Sylvies sometimes have.